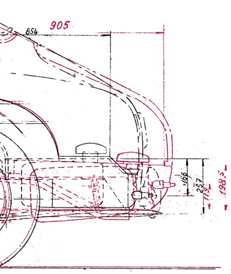 A comparison of two Lancia chassis drawings for the B20 allows an appraisal of the differences between series. Here, a s.4 body (in red) is compared to a s. 1 body (in black). in the rear deck lid and trunk area – the s. 4 has a revised gas tank, a longer flatter trunk floor, and a longer rear end. in the overall cockpit area – the s. 4 is lower, the windscreen is more laid back, and the windows are located differently. The factory drawings were found as xeroxed copies on Ebay some time ago. They are dated 1951 and 1954, and show major chassis dimensions, location of major assemblies and control points. The s. 4 drawing is very similar to the s. 1 drawing (probably traced over it), so they can be laid over each other to see variations. They were probably used as a check for chassis fabrication or as a coordination drawing with Pininfarina. The section comparison shown here has been cleaned up, with only some lines removed. above – title blocks for the two drawings. below – the differences in the trunk area. The s.4 has a larger trunk, and revised gas tank. Note exhausts, and the s. 4 has a longer rear.